Composite resin bonding – what is it? Am I suitable for dental bonding? Composite bonding is the process of applying a material called dental composite or composite resin to the teeth to make them look better and more aesthetic. Patients who come in for this procedure often feel their natural teeth are slightly crooked, not as white as they want, cracked or chipped. 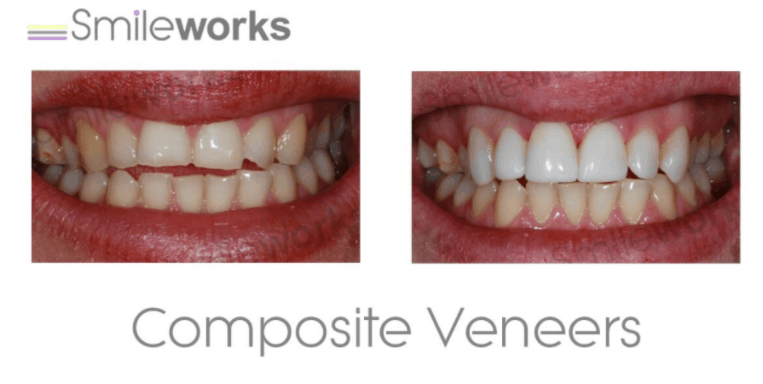 Composite veneers or a composite veneer ‘smile makeover’ is where composite resin is applied to any teeth or all of the front teeth (also know as the social six). This is not the same as resin bonding although the veneers are made from a similar substance. Composites are also not the same as ‘composite fillings’ which are also known as white fillings for the back teeth or dental crowns which cover all of the surfaces of the tooth not just the visible parts and are made from porcelain. It can sound quite complicated but read on and you’ll get it all explained to you. If you’re looking for something more dramatic than single tooth bonding – or fixing a number of damaged or broken teeth then you will need to make an appointment with a dentist. You can learn more on our main porcelain veneers page. 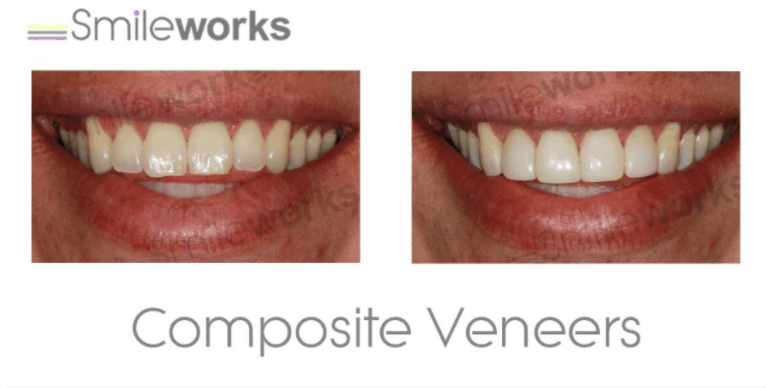 Or to discover how you can get a smile makeover without breaking the bank then take a look at our composite veneers here. 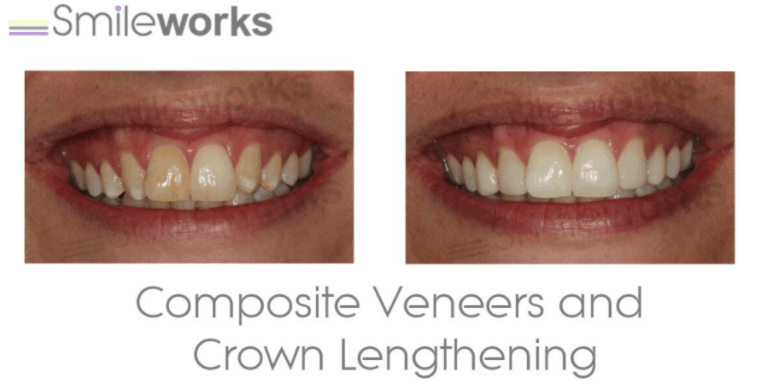 Composite veneers are a pure art-form and although less expensive than porcelain veneers they must be created by a dentist who has a deep understanding of how your bite works so that the last for a long time. Follow the link here to learn about veneers cost. Or about getting a full smile makeover. 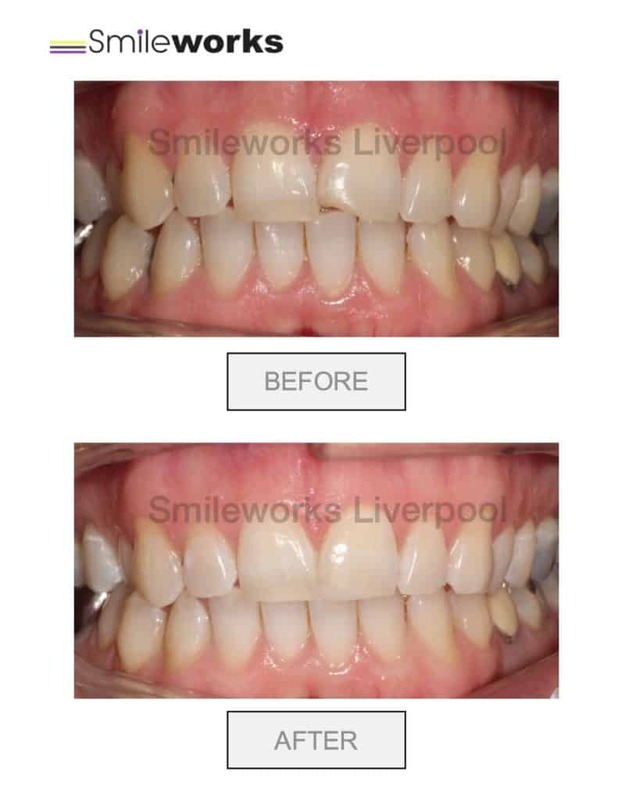 Also composite can be used for patients with small teeth which show too much gum when they smile and you can read all about gummy smiles here: gummy smile Liverpool. Composite bonding is a great fix for many patients for a number of reasons. Firstly it’s a quick appointment and patients only need to visit the dentist or dental hygiene therapist once to have the treatment completed. So it’s a one visit treatment. This saves you time and money. This is unlike porcelain veneers that take a number of appointments and can take up to three weeks to complete. Another advantage of composite or resin bonding is that it doesn’t damage the underlying tooth. It is the least invasive way of getting teeth restored and fits well with the Smileworks culture of less invasive, conservative dentistry. This simply means that we are always thinking about the health and future of your smile and not just concentrating on the here and now or trying to take as much money from you as possible. We have plenty of patients here and get to do the work we love so can focus on what you want not on what’s best for us. Sadly, in 2018 the same cannot be said of many dentists here in Liverpool. The composite material (Usually Renamel® or 3M®) is sculpted onto the teeth and there is no need to drill or file your existing teeth with no pain or damage. Many patients don’t understand the risks of having teeth drilled before getting porcelain veneers fitted. Especially younger patients in their 20’s and 30’s. We can count on one hand the amount of porcelain veneers we’ve fitted for younger patients because we consider it very risky, expensive and (in most cases) not in your future best interests. The process of drilling the teeth – no matter how talented your dentist is – will always increase the risk of your healthy teeth becoming damaged or failing (falling out). This could lead to you needing a root canal or eventually implant treatment. And how many times have you heard of people having treatment abroad and having to go back to Turkey or Greece because one of their veneers literally just fell off! For more information on getting veneers abroad follow the link. These are the risks and is one of the reasons a less invasive approach is usually better. If you are young and have healthy teeth, watch out for your dentist getting all ‘gung-ho’ and recommending you have all your teeth replaced with porcelain veneers. This is also (not surprisingly) the most expensive treatment and requires the least amount of skill because the teeth are made in a lab and not sculpted while you are sitting in the chair. Porcelain veneers are a huge decision and your underlying teeth will be permanently damaged by the procedure. Composite bonding, on the other hand, is a reversible procedure and causes no harm at all. DO NOT GO ABROAD FOR TREATMENT. This is just a silly idea given the wonderful tools, people and procedures available here in the UK for the same price or less. If you are thinking of going abroad then you need a better dentist! What is more, once you return and ask us to ‘fix it’ for you. We will not be able to because your notes will be in a different language and the work is sometimes so bad our dentists will not put their names to it. There are a number of important differences between dental composite bonding and porcelain veneers. Porcelain veneers are an invasive dental procedure. This means injections, the dentists drill and irreversible ‘prepping’ or drilling of your existing teeth. ‘Over-prepping’ is where a dentist makes a mistake and takes away too much enamel and causes damage to the sensitive underlying tooth structure. This can be fatal to the tooth. It can cause them to become damaged or fail. Patients who have porcelain veneers go through the ‘tooth prep’ procedure where some enamel is drilled away to make space for the veneer. 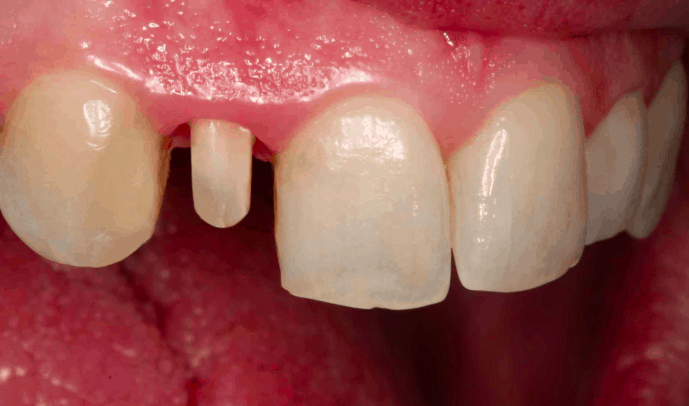 Many younger patients or patients with more healthy teeth will not want to take this risk. We like healthy teeth at Smileworks. Let’s not turn them into little pegs if we don’t absolutely have to. The second major difference between composite and porcelain is the time. With tooth bonding the procedure takes about an hour. You’ll be in and out of the chair before you know it. No injections and no drills. And the difference between the before and after leaves many patients amazed! 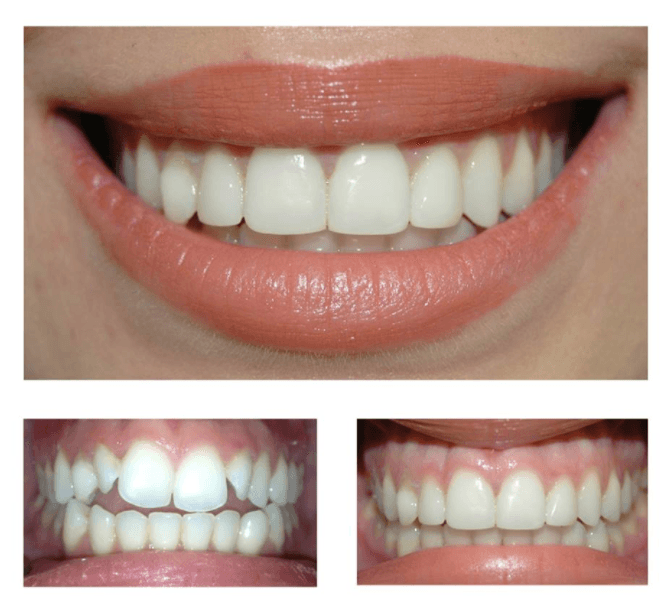 Conversely, porcelain veneers are a much more involved procedure. There’s the prepping of the teeth in the first appointment. Then your dentist will work with a lab or ceramist to get your veneers made just how you want them. During this time you’ll be given ‘temporaries’. These are temporary veneers while you wait for the final work to come back from the lab. Once the veneers arrive, they are fitted in another appointment. Then a follow up appointment is needed to make sure they fit perfectly. Your dentist also must make sure they haven’t negatively affected with your bite in any way. The procedure can take up to a month and is much more involved than tooth bonding and also goes wrong more of the time and carries a whole host of additional risks. Many dentists are not familiar with – or don’t have much experience with composite resin or bonding materials. Thy have been fitting traditional veneers for their whole careers and are uninterested in this fabulous breakthrough in dental technology and materials science. So be careful if anyone says to you that they ‘don’t do resin bonding’ or ‘you’d be better off getting veneers’. They may be giving good advice but they also may be compromising your natural teeth because they haven’t gotten to grips with composite science. 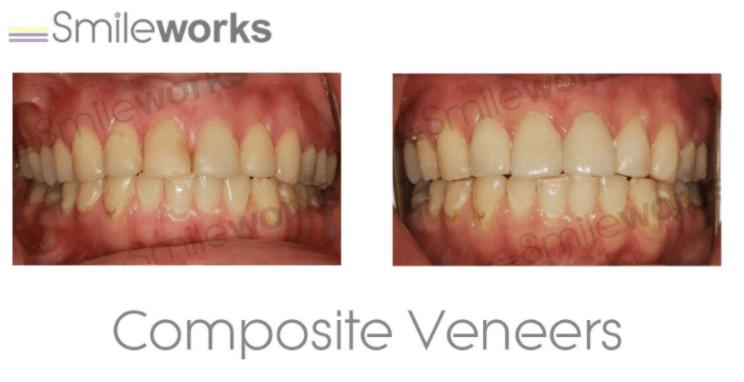 Here at Smileworks we use a beautifully lifelike and translucent composite material called Renamel® by cosmodent. It gets us some truly beautiful results but it’s tricky to use and there’s as much art as science in a beautiful Renamel® case. Bonding is all about selecting the right patient for the procedure. Not everyone is suitable and your dentist will need to assess your mouth fully to determine whether you are a fit for the treatment or whether something else might be more appropriate. That said, most people are suitable for composite bonding. Especially if you have healthy natural teeth. Remember healthy does not necessarily mean they look the way you want! Many patients have beautifully healthy teeth and gums but they might be misshapen, gappy or crooked. If this sounds like you then resin bonding might be the perfect treatment. If you think your gums aren’t as healthy as they should be – take a look here at our gum disease treatment page and get treatment from our dental hygiene therapists – the same people who will likely be doing the bonding too. When assessing a composite bonding case its important to find out what has caused the problems in the first place. If you grind your teeth, bite your nails or have other habits like biting pens or – god forgive you – opening bottles with your teeth, then composite bonding might not be right. This is because the composites will soon suffer the same fate as your natural teeth. You need to make sure your dentist does a full and detailed assessment of your bite. Also any habits that you might have need to be considered. Furthermore, any underlying health issues need to be assessed to make sure you’re a good candidate and your composites will stay looking great for a long time. Although Dr Billy quotes £200 per tooth in the video (below) a dental hygiene therapist (such as Rebecca and Bambi here at Smileworks) can create beautiful composite bonding results for less. This is for the simple reason that Billy has much more experience and his work will reflect that. Composite bonding is much less expensive than porcelain veneers, braces or most other ways we dentists can fix your tooth problems. This is one of the reasons it’s such a popular procedure here at Smileworks. Dental composite bonding of a single tooth starts from £150 per tooth. This is pretty amazing when you look at the before and afters and see that a massive difference has been made to the patients smile for just a few hundred pounds. This is compared to porcelain veneers that can cost five times the amount of composites and carry all the risks we’ve discussed. Many patients will choose to have composite bonding after they’ve finished their braces treatment to produce really perfect and beautiful results. This is because sometimes when we move the teeth with braces their edges might not line up correctly. Dental composite bonding is a great fix for this and adds just a few hundred pounds onto the bill. But the best way to spend your money at Smileworks (in our opinion) is with whitening and composite bonding. This is where the teeth are whitened to the correct brightness and then composite bonding perfects the edges making them look really beautiful. This is a HUGELY popular treatment here at Smileworks and patients absolutely love the results and, of course, tell all of their friends about us. For more information specifically about the price of all sorts of different veneers, take a look here: Veneers cost. Most Patients pay for their treatment on finance and composite bonding is no different. Click here to open the calculator and see how much your monthly repayments would work out to. We have performed hundreds of composite cases. Treating patients who just want to fix a chip or gap, to others who want a full makeover. It is our aim to make every patient beam with confidence and change their lives for the better. So just to prove to you what an amazing and versatile treatment composite bonding is we’ve put together a beautiful before and after gallery for you! One of the first steps we normally take with patients before composite bonding treatment is whitening. We can colour match to your desired shade and then choose the colour and shade of the resin. Composite veneers don’t change colour if you try to whiten them. If you are happy with the shade of your teeth, AMAZING! It just means we can skip this step. If you want a brighter smile we would recommend whitening first. We offer only the best whitening to produce stunning results, starting at only £199. Head over to our Professional Teeth Whitening page to check out your different options! 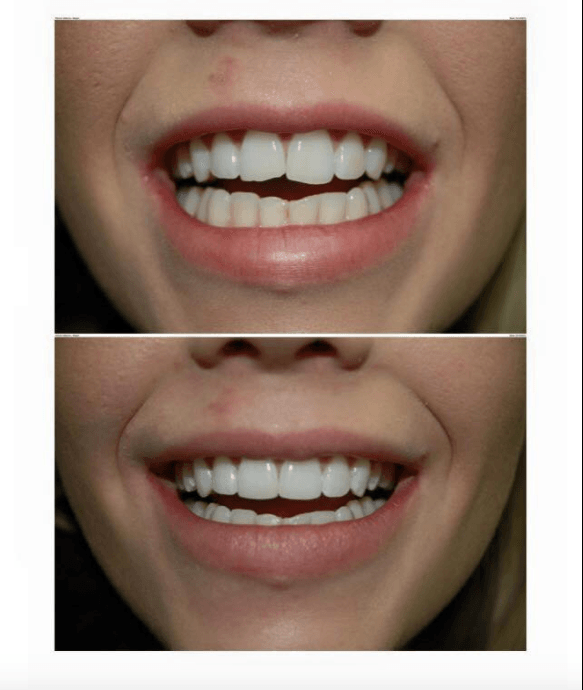 This patient attended after an emergency on a night out and had no pain or pulp exposed so Rebecca our oral hygiene therapist, under the prescription of a dentist in our emergency dental clinic applied the composite material to create a beautiful, lasting and lifelike restoration. This tooth needs to be monitored to make sure it remains healthy because it was quite a knock and X-rays and further investigations will be needed to make sure it stays vital (or alive) and doesn’t start to go grey or start causing the patient pain. The cost was around £200. How long your bonding lasts will be largely dependent on you. That said, correct diagnosis, talented hands and a great relationship with your dentist or dental therapist will help your composites last longer. We usually say they last between 5-8 years. Composite resin is not indestructible and will be subject to wear and tear. Like everything, if you look after them they will last longer. Smileworks dentists guarantee all of their work. Your composites will be under guarantee for longer if you join one of our dental plans. Strangely enough the question, ‘how long does it last’ is one we get asked a lot. However, we rarely have any patients complaining that their composites have not lasted. We rate ourselves here at Smileworks and we will only treat responsible patients who will look after them. So we have few if any complaints. 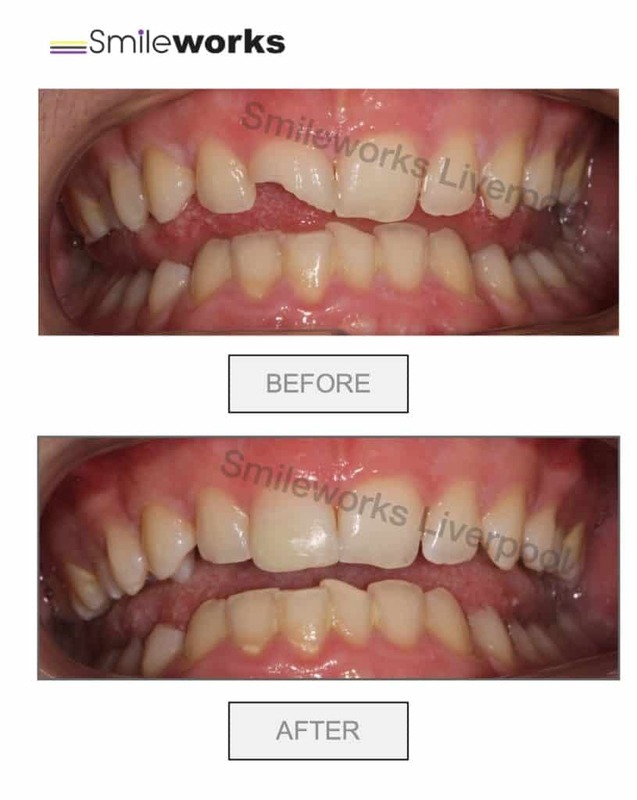 In the event you do break or chip a composite restoration or and need it fixing in an emergency then follow the link here to our main emergency dental page here: emergency dentist Liverpool. Call the office and a member of the team will be able to see you and fix your problem the same day. This would be a resounding YES! Composite bonding is one of the less risky, less expensive and less hassle treatments available. Combined with whitening or braces it produces some really stunning results. Sadly many patients are not aware of this fabulous procedure and this is why we write you articles just like this so that you can consider all the options for your ongoing dental health. Here at Smileworks we’re a conservative bunch of dentists. This doesn’t mean any particular political affiliation but more that we don’t mess with healthy teeth. It saddens us when young patients come to us with dreadful ‘toilet-bowl’ white porcelain veneers that have permanently damaged the health of their mouth. It’s not how we roll and shame on you dentists in Liverpool for taking advantage of your patients! Composite bonding is a much better solution for many patients and one that we’d love to talk to you about more. It’s cheaper, safer and better for you in the long term. 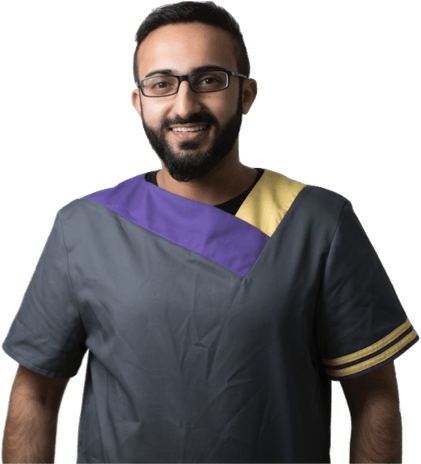 To book an appointment or speak to someone about this wonderful procedure fill out the form below – or read on for more on tooth bonding and to find out what it’s like at Smileworks in our 30 second introduction video.